The government has unveiled a new label that it hopes will ultimately improve animal welfare in Denmark as consumers are afforded more transparency when shopping for meat. 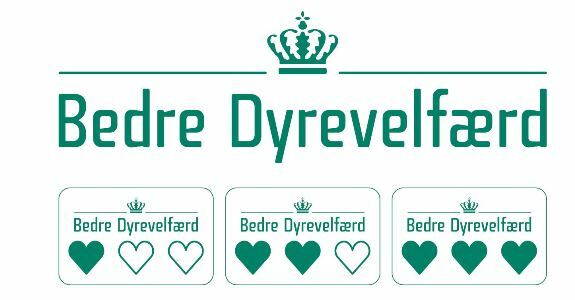 The new label, ‘Bedre Dyrevelfærd’ (‘Better Animal Welfare’), has three hearts that are filled out in relation to how much animal welfare the farm animal enjoyed before being slaughtered. If all three hearts are filled, this indicates the animal received the best welfare possible. “I hope that Danes will welcome the new animal-welfare label. The label will give consumers more choice and enable them to support animal welfare that suits their preference and their purse,” said the environment and food minister, Esben Lunde Larsen. Initially, the label will only be attached to pork products, but it will later be expanded to include meat from other types of animals. The labels will be visible in the supermarket chains Bilka, Føtex, Netto, Meny, Rema 1000, Kiwi, Spar, Lidl and Aldi, and also at butcher shops.